This case is featured in our e-book 10 Amazing Carpet Cases We Love. Read the full case and more like it in the e-book here. 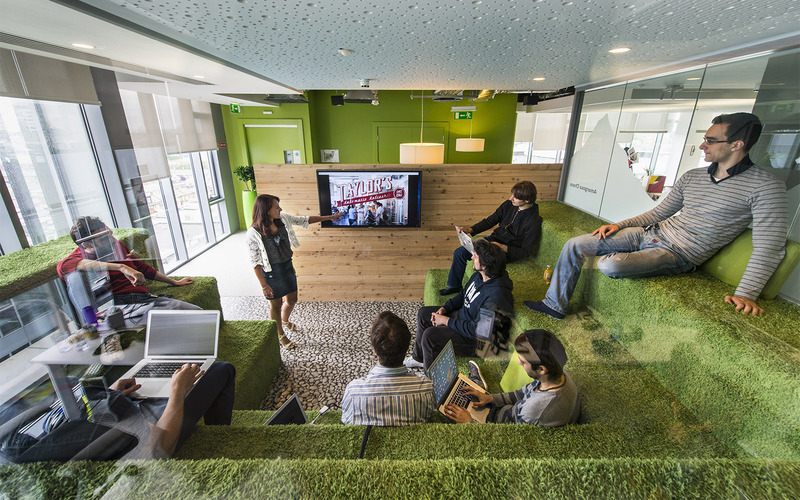 With over 47,000 square metres of office space, Google’s Dublin campus spreads across four buildings in the heart of the historic dock-lands district. An amazing workplace for Google’s ever-expanding sales, marketing, finance and engineering teams, the campus is the place of employment for people from more than 65 countries, speaking over 45 languages. The tallest of the four campus building is the newly constructed 14-storey building ‘Google Docks’. Two other buildings – ‘Gasworks House’ and ‘Gordon House’ – were already home to Google and were completely refitted. A fourth building, ‘One Grand Canal’ was also newly fitted out. For the Masterplan, the architects had to find a smart solution to the nearly impossible – to create a stimulating and interactive campus within a bustling environment in the midst of the inner city. Apart from innovative office spaces, the Masterplan required the successful organisation of a multitude of additional functions, including five restaurants, 42 micro-kitchens and communication hubs, games rooms, a fitness centre, a pool, wellness areas, a learning and development centre doubling as conference centre, tech stops, over 400 informal and formal meeting rooms and phone booths and much, much more. All these functions are part of the holistic work philosophy of Google, encouraging a balanced, healthy work environment and enabling as much interaction and communication between Googlers as possible. With a total floor area of almost 50,000 square metres, the designers were able to take full advantage of the creative freedom allowed to them by the client to specify both hard flooring and an amazing range of carpet designs. Carpet design runs the gamut from faux natural finishes such as stonework, wood, grass and sand to unique designs incorporating Ireland’s ‘prides and joys’, including an excerpt from James Joyce’s Ulysses, sheet music from The Pogues’ song ‘Fairytale of New York’ and traditional Celtic ornamental patterns. And carpet is not just confined to floors. 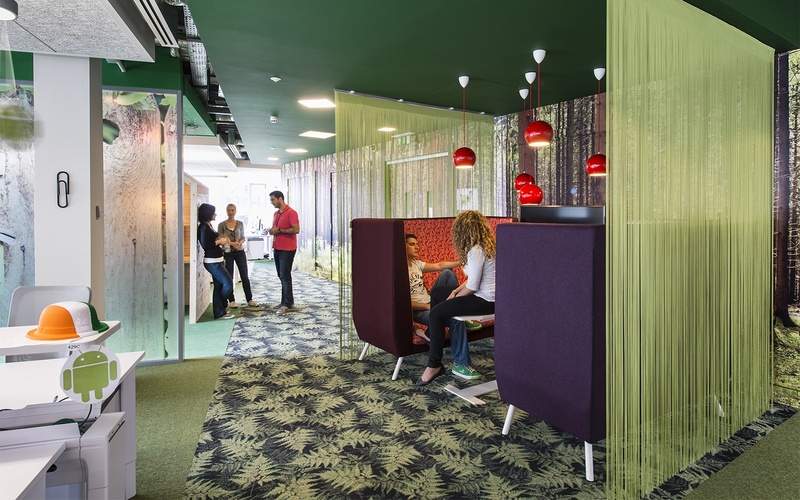 In an informal meeting area, steps are covered in fluffy, grass-like carpet to double as seating and in one games room, an amazing snake-patterned carpet continues to slither up one wall. 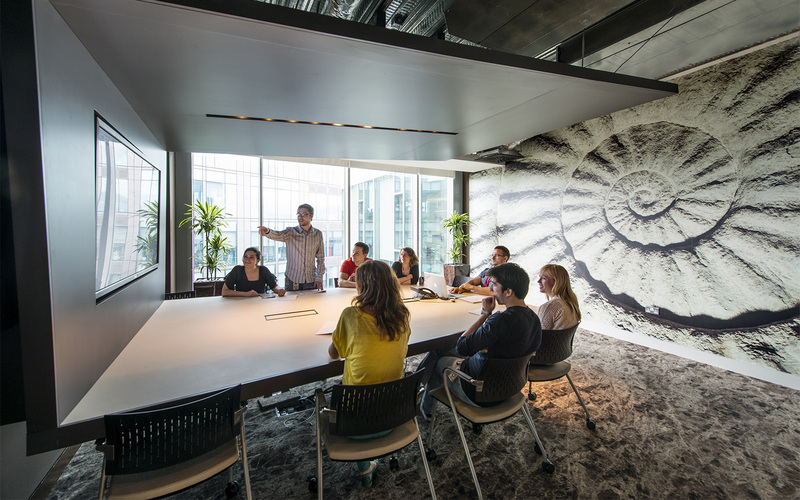 Exciting carpet designs can be used to create stimulating ‘mini-universes’ in a large fit-out. Use plainer carpet in desk areas and bolder carpet designs in areas where they will be fully appreciated. Using carpet tiles gives easy access to under-floor cabling for maintenance purposes, which is greatly appreciated by busy workplaces requiring high flexibility and low down-time.